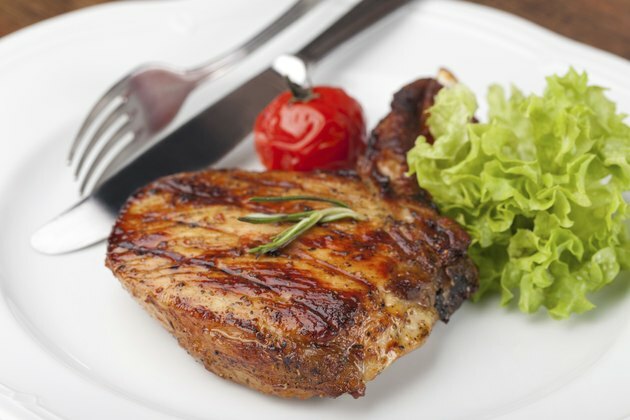 A thick veal rib chop is best prepared using a two-step pan-roasting process. Begin by frying it over high, direct heat to create a nicely seared exterior crust, then finish it more gently with indirect heat in the oven to cook the inside all the way through without charring the outside. Frying has a bad reputation where healthy cooking is concerned, but you can at least make your added calories heart-healthy by using canola or other unsaturated fat-based oil rather than butter or other saturated fat. Finish your veal chops with fresh herbs and spices to make them more nutritious, too. Set the veal chop out on the counter 1 to 2 hours ahead of time to get rid of its chill. Cold meat doesn't cook as quickly or evenly as meat brought to room temperature first, and that's a particular disadvantage when working with a thick cut. Pat a liberal amount of sea salt or coarse kosher salt over all the meat. Large grains do a good job drawing water out of the meat and seasoning it. Salting well in advance ensures the meat gets the chance to reabsorb the seasoned moisture, rather than it getting cooked off the surface and leaving you with dried-out veal. Preheat the oven to 400 degrees Fahrenheit during the last 10 to 15 minutes of keeping the veal out. This ensures it's good and hot by the time the seared veal goes in. Place a large cast-iron, stainless steel or other heavy-bottomed, oven-safe frying pan on a burner over moderately high heat. These quality skillets get really hot and distribute the heat evenly for a good sear. Season the rib chop to taste with freshly cracked black pepper, chili powder, rosemary, sage, oregano or other desired herbs and spices. Flick a few drops of water into the pan. It's hot enough for frying once the drops evaporate immediately upon hitting the surface. Pour in enough cooking oil to coat the bottom and swirl it around for about 30 seconds as it heats up. Lay the veal chop in the skillet and don't move it. Sear the first side for 2 to 3 minutes, just until it's well browned and crispy. Turn it over with tongs and sear the second side the same as the first. Return the chop to the first side, turn off the stove and transfer the pan into the center of the oven. Use oven mitts, as the pan handles will be hot. Rest the veal chop for 5 minutes before serving it. Its internal temperature rises another 5 degrees or so, bringing it to the USDA-recommended 145 F, and its juices settle.